My six-year-old daughter made her first charitable donation this year. She decided to save the endangered chimpanzees. She’s an animal lover so the organization did not surprise me. The giving did. I donate regularly to wildlife organizations. She sees the catalogs, the free gifts. One day an appeal from Save The Chimps arrived in the mail. 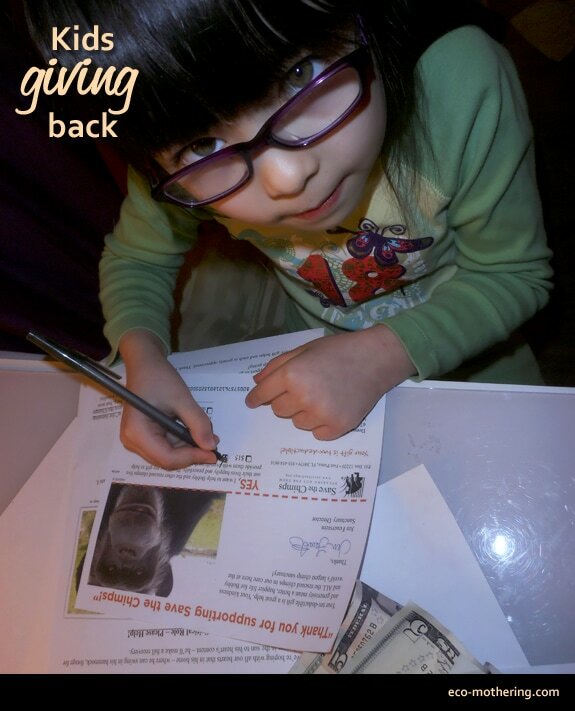 I did not know them, but asked Sofie — who had recently shown an interest in chimps and monkeys — if she wanted to donate. She immediately said yes. I explained this meant giving some of her money. (I offered to split the $25 donation with her.) We also discussed why the chimps needed saving. She wanted in. She opened up her piggy bank. I wrote the check. A month later, the mother of one of Sofie’s school friends thanked me for my daughter’s activism. Sofie’s kindergarten teacher expounded. Apparently, Sofie had instigated a “Let's save the animals” campaign among her classmates. She told them about the plight of the chimps, how sad she was that they were being taken from their families and put into cages for experiments. My daughter is becoming a social activist at school, yet all I hear about at dinner is how she played Star Wars at recess. I’m proud of her, of course, so much so that I have been inspired to expand my charitable contributions via Eco-Mothering. Every season I’ll choose a charity to receive 5% of the profits made from my blog that quarter with a minimum donation of $25. The focus of my selected charities? The environment, of course, plus animals and children. Check out my selected charities — maybe you'll be inspired to give yourself. On a normal day, about 5.5 million pints of Guinness are consumed around the world. On St. Patrick’s Day, that number jumps to 13 million. (source) Drink as much Guinness as you like, but please remember to recycle those bottles and cans afterward. Or support a more eco-friendly beer company such as Colorado’s New Belgium Brewery (Fat Tire beer), the first wind-powered brewery in the nation. Also sustainable, Sierra Nevada Brewery gets much of their energy needs from solar panels and hydrogen fuel cells, powers their trucks on 100% vegetable oil waste, and, in 2011, diverted 99.7% of the brewery’s solid waste from the landfill through recycling, composting and reuse. And I don’t mean unnaturally green-colored foods like milkshakes and pastries. That artificial food coloring (FD&C Green No.3 and Fast Green FCF) is derived from petroleum and has been associated with hyperactivity in children, allergic reactions and cancer. You can celebrate St. Patty’s Day with real green foods (a fun themed dinner: cabbage, asparagus, kiwi, grapes, avocado and pistachios! ), or try a homemade dye. Better yet, eat green by shopping for local or organic foods. Invest in one special shirt or outfit that you bring out every St. Patrick’s Day. Or scour secondhand stores for green garments (I always see barely used “Kiss Me, I’m Irish” T-shirts at Savers). If you must buy something new, support one of the top buyers of organic cotton from this list that includes Pottery Barn, Nike and Wal-Mart. 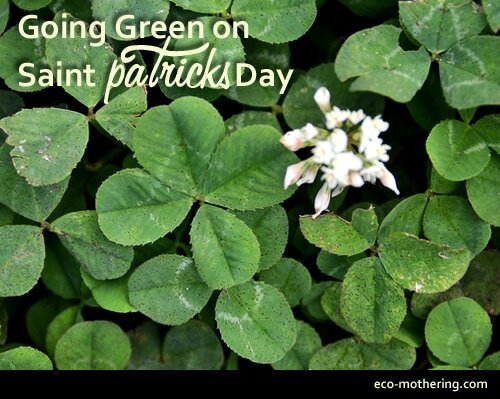 If you’ve bought St. Patty’s Day decorations, save and reuse them every year. Otherwise, decorate with natural items: plants from nature, green bottles and vases, green fabrics. Check out this blog for some creative crafting ideas using items around the house. Although I live in driving distance of two of the nation’s biggest St. Patrick’s Day parades—Boston and New York—I’ve never been to either. Nor do I plan to. I couldn’t stand the crowds (close to 5 million people between the two cities) or the massive amount of trash generated during these events. If you attend your local town’s parade, do your part by not littering. Go one step further and bring a bag along to pick up any trash you find along the route. Neighborhood residents will love you for it. If you liked this post, you’ll love my book, The Guilt-Free Guide to Greening Your Holidays. It has 95 pages of tips and inspiration for making all your holidays eco-friendly. Click here to learn more! Recently my nine-year-old has mentioned a desire to eat less meat. We are not a vegetarian family, but Sofie has several vegetarian friends and a soft spot for animals. As much as she loves the taste of most meats, I think she’s grappling with the realization that animals are being killed for her food. I’m all for supporting this change. A semi-vegetarian lifestyle is healthier and eco-friendly (learn why). My role now is to determine good sources of protein to replace the meat in Sofie’s meals. As the main building blocks of the body, proteins are necessary for building and maintaining our muscles, tissues and organs; fueling our brains; and aiding in specialized functions. A “complete” protein includes all nine essential amino acids that our bodies cannot produce on their own. Vegetarians often get all those amino acids through eating a varied diet. After some research, and knowing my daughter’s tastes, I’ve decided to focus on these seven protein sources for Sofie. Some were surprising, especially since I didn’t have much idea of proteins beyond beans and eggs. 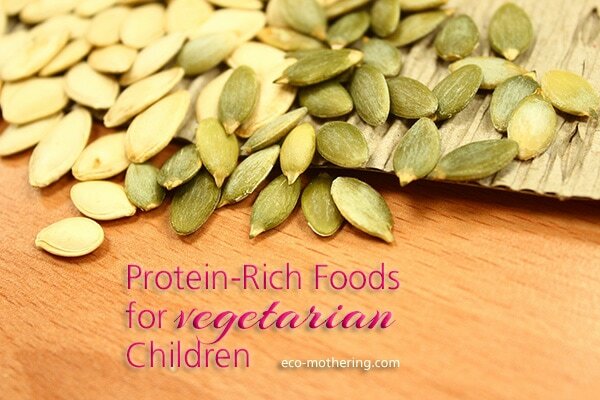 I’ve also included links to some kid-friendly recipes for each protein. This nutrient-rich food is a complete protein (8 grams of protein per cooked cup) high in fiber, iron, magnesium and calcium. Although often grouped with grains, quinoa is actually part of the food family that includes spinach, beets and Swiss chard. Kids might enjoy its many colors (white, red, orange, purple, black) and its somewhat nutty flavor when cooked. Quinoa can be eaten in a variety of ways from soups and stir-fries to breakfast porridge and meatballs. A member of the legume family, lentils are packed with B vitamins, fiber, folate and 18 grams of protein per cup. They fill you up in a most nutritional way and have a nutty, earthy flavor. Again, lentils can be fun to choose by color: green, brown, red, yellow and orange, although green and brown lentils retain their shape better when cooked. Peanut butter has been a kid favorite for decades (learn the history of peanut butter), and the peanut is a legume containing vitamin E, folate, copper and biotin. Peanut butter offers about 8 grams of protein per 2 tablespoons. How do other nut butters compare? Almond butter has 7 grams per 2 tablespoons and includes a good amount (80 mg) of calcium. Sunflower seed and soynut butter both contain about 9 grams of protein; soynut has 60 mg of calcium, while sunflower is rich in magnesium, zinc and iron. Any nut butter can be enjoyed as a spread or a dip for fruits and veggies. Pumpkin seeds—sometimes known as pepitas—are a complete protein that also provide good levels of manganese, copper and zinc (eaten unshelled). They can be eaten raw, baked or boiled and offer a sweet, crunchy flavor along with 12 grams of protein per cup. With 13 grams of protein per cup, chickpeas are also an excellent source of manganese, folate, fiber and folate. They have a buttery and starchy texture and a slightly nutty flavor. You can find chickpeas dried or canned, which is quicker for cooking (dried ones require pre-soaking). Be sure to rinse the canned beans first or seek out BPA free versions. An excellent and delicious source of calcium, potassium and probiotics, Greek yogurt has the edge on regular yogurt because it typically contains half the sugar and double the protein. One cup of plain, nonfat Greek yogurt contains 25 grams of protein. Fruit varieties have more calories and less protein (about 10 grams per cup). Try sweetening plain yogurt with fresh fruit and honey for your kids. One egg contains about 6 grams of protein (3 grams in the white and 3 in the yolk), yet each part contains all essential amino acids, making them complete proteins on their own. This is good news for a girl who only likes the whites (unless scrambled). Eggs are also an excellent source of B vitamins, selenium and iodine. What recipes do you have for vegetarian proteins? Baby registry lists and big box stores offer a wide variety of stuff they make you think you actually need. You can get sucked into all of that (it isn’t hard), or you can simply buy the basics—which comes as a relief to moms-to-be who plan to parent more naturally. Mothers have been parenting successfully long before we had baby monitors and bouncy seats. So don’t feel like you have to take out a loan to prepare for a baby. You’ll save space, money and the earth by sticking to the basics. Below, I talk about four baby gear basics: carriers, car seats, breastfeeding supplies and strollers. Part Two of this post goes into bedding, diapers and miscellaneous items. Baby carriers are one reason I wish I had another baby. While they weren’t so popular or accessible when Sofie was born seven years ago, now there are so many carriers on the market, your choices are overwhelming. The best thing to do is try them out in person. We used a stuffed animal to sample a few carriers when I was pregnant (though it would have been better if we weighted the teddy bear to be about 8-10 pounds). While many carriers are expensive, you can usually find them secondhand at consignment shops or online sites and mommy swaps. Invest in a couple of carriers you love. Some feel better forward-facing, some are better for carrying on your back, some are just too pretty for your husband to wear. The carriers will get a lot of use, so this is one area natural mamas can feel okay about splurging on. We used a New Native sling (fairly easy to slip on when Sofie was small, but my husband could not fit into the same size), the Baby Bjorn (my husband’s preferred option), and a mei tai made by a friend. If I could do it again, I’d replace the Bjorn with an Ergo, which I’ve heard so many wonderful things about. I did love the mei tai, and we were able to use it as a back carrier until Sofie was four. We chose to wear our baby because I’d read that constant human contact was one of the best things for a newborn. Once Sofie was born, it just seemed instinctual that I keep her close to me. She was less fussy that way, and I got much more done while she slept or observed my actions from the carrier. Wearing our daughter was an important bonding experience we cherish; we were even part of a local babywearing group, which was my first community of other new moms. You can read about the benefits of babywearing (babies cry less, learn more and grow smarter) from Dr. Sears. View a detailed comparison of baby carriers (or join the forum to ask loads of questions) at thebabywearer.com. Several online sites, including Heavenly Hold, offer a rental program to try out carriers before buying. Search for a babywearing group in your area, as it will be an excellent source of information. Car seats are a necessity, yet they are not easily recycled, so one of the greenest thing you can do is buy as few as possible. 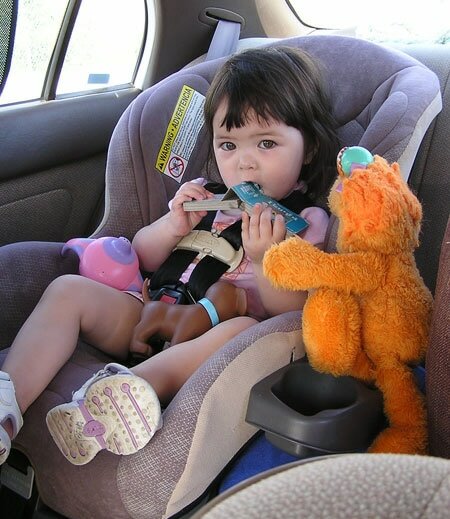 You’ll need to use them until your child fits a regular seat belt (usually between ages 8-12). These days, everyone thinks they need the infant car seat, which is why you see many parents walking lopsided with a baby dangling from their arm. How uncomfortable is that? To me, infant car seats are a poor purchasing choice because: (1) They literally keep baby at arm’s length rather than offer close human contact, and (2) They are quickly outgrown. Generally, these seats go up to 22 pounds or until baby’s head is taller than the rim of the seat (often by age one); then you have to purchase another expensive car seat and figure out how to dispose of the first one. Convertible car seats have a higher weight limit (typically up to 40 pounds), and many can be used from birth. They work in both rear-facing and forward-facing positions as your baby grows. Today, there are also 3-in-1 car seats on the market that convert from rear-facing to forward-facing to booster seat. Be sure to research the specific details, weight and height limits and restrictions of a manufacturer’s car seat before buying one. This one can be propped into the semi-reclining position for newborns and includes the five-point harness system. We added extra head support and harness strap pads to keep Sofie’s newborn self snug and safe. Those are easy to find and not at all costly. You can even use tightly rolled up towels to fill in extra spaces. Healthy Children has information on the types of car seats your child will need throughout her life. Here are a few websites with information about car seat safety, models, inspection and installation and recalls: Car-Seat.org and SaferCar.gov. When your seat has expired or been outgrown, read my post on ways to properly dispose of an old child car seat. Sofie used her Graco convertible car seat from birth through age four. I knew before I was pregnant that I would breastfeed my child. While we struggled early on, nursing was an incredible bonding experience that lasted until Sofie was three. It was my panacea for tantrums, sickness and tough situations (like doctor visits), and I believe it’s what kept her nearly sick-free during those years. The benefits of breastfeeding are hailed by many including the American Academy of Pediatrics (AAP), Center for Disease Control and Prevention (CDC) and the World Health Organization (WHO). If you’re on the fence about whether or not to nurse, you can check out any of their sites or visit La Leche League’s archive of breastfeeding articles and links. A quality breast pump is number one on my list for working moms. If you plan to be a stay-at-home mom, you may not need a breast pump, however you might consider the option if you’d like Dad (or others) to feed the baby with your milk or in case you have issues with engorgement or latching on. Research the types of breast pumps available, and you can find many online lists rating the best pumps (Medela often tops the lists). Although pricey, it is safest to buy a new breast pump. Pump rentals from your hospital are an alternative — those are designed to have a “closed system” where the breast milk never touches the working parts used by other mothers. Here’s a list of “closed system” pumps safe for multiple users. Note: Be sure to open the breast pump box and set it up before the baby is born! We did not do this and discovered an essential piece was missing from the pump only once I had a wailing newborn and painful breasts our first few days home from the hospital. Breast milk can be stored in any food grade container with a tight fitting lid, including glass or plastic baby bottles (choose BPA-free plastic). To save space in your fridge or freezer, you might like to have some breast milk storage bags on hand as well. There is one eco-friendly option: Simple Wishes HoneySuckle whose plastic bags are BPA and phthalate-free and recyclable (but not reusable). If you want others to share in the feeding, you’ll need bottles, and there are many brands out there. Glass bottles, used when I was a baby, are back in fashion as being one of the safest (no toxins) and sustainable options. A few BPA-free plastic options include: Green to Grow, mimijumi, thinkbaby and Born Free. Along with breastfeeding comes leaking, so you’ll want to be prepared — particularly if you’re returning to work. Purchase reusable nursing pads that line your bra and prevent milk from leaking through onto your clothing. You (or a crafty friend) can always make your own pads from scrap material. Here’s a tutorial and pattern from DIY Maternity. Though not necessary, a nursing pillow is especially handy for first-time moms learning the proper techniques. You’re likely already familiar with the Boppy or My Breast Friend, and (if it's still around) there is the eco-friendly San Diego Bebe Nursing Pillow. This item is optional. You might find that wearing your baby nonstop works for you. We liked having the stroller available for traveling, nighttime walks and grandparents who did not feel comfortable wearing Sofie. We chose a small, lightweight one that folded easily with one hand, since that’s often the position I found myself in. That one $40 stroller lasted us from birth to age two when we switched to a $2 umbrella stroller bought at a yard sale. Remember, a stroller is simply for mobility; it doesn’t need to be kitted out with tons of toys and contraptions. Since the stroller is not a high-use item for most natural mamas, you can easily save one from heading to the landfill by shopping at consignment shops, yard sales or online. If you prefer to buy new, these days you can choose from some eco-friendly models that use recycled, non-toxic fabrics or support companies that follow green principles. A few green strollers currently on the market include Stroller G2 from Orbit Baby and Bumbleride. In Part Two of this post, we’ll talk about diapers, bedding and other baby products. I was one of those moms who vehemently stated that my child would follow the American Academy of Pediatrics (AAP) guidelines and not have any developmentally destructive “screen time” before age 2. That assertion lasted until I gave birth when zoning out in front of the television was one of the few things that didn’t send my post-partum-depressed self reaching for the Xanax. During that first winter, watching movies with my husband while endlessly nursing my newborn became a regular activity. With Sofie’s limited infant vision, I didn’t feel terribly anxious about it then. However, when her television consumption steadily grew over the next 18 months, so did my guilt. It began with intense crying bouts of nighttime teething during which we quickly learned that a Baby Einstein video (shower gift from wiser friends) was one of the only things that would calm my daughter. Too easily, Baby Einstein went from teething distraction to give-me-enough-time-to-make-dinner babysitter to Mommy-just-needs-a-break! video madness. Of course, I felt like a bad mom. Where did my initial resolve go? And why does the AAP advise against screen time? 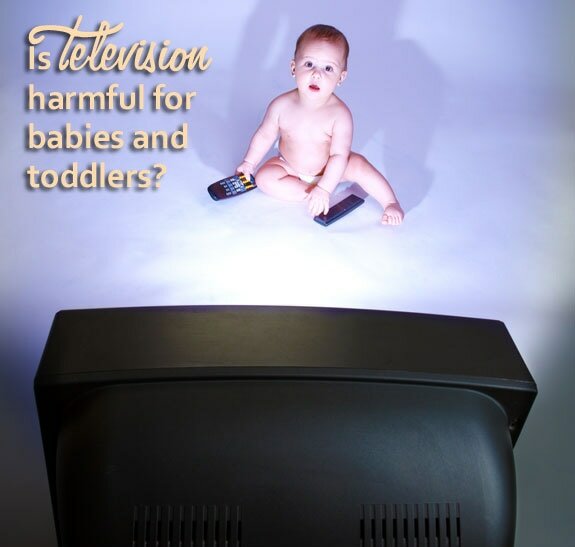 What’s the harm of television for children under two? Research has shown that age period to be a most significant one in the brain’s development; television images can confuse and slow that growth, especially in areas of language development and reading. Studies show that babies and toddlers learn best from human interaction and unstructured play. Screen time is like mental junk food for their brain. I’d love to say that we bit the bullet and locked the TV in a closet for two years, but we didn’t. Instead, we screened Sofie’s shows and tried to maintain some standards. You can’t go wrong with Sesame Street an educational show that stands the test of time. Dora The Explorer, with its focus on animals and exploring the environment, gained our parental approval. I remember watching a Dora episode with Sofie in which she learned how to recognize ecological landmarks, say “mudslide” and bleat like a mountain goat. All good things. In contrast, my husband banned Bob The Builder after previewing an episode in which Bob and friends recklessly dug up acres of coastal land, undoubtedly destroying several ecosystems in the process. Definitely not the kind of message we wanted our daughter to internalize. As a family, we regularly followed only one show at the time--American Idol—a choice I rationalized as “music appreciation” while our musically-inclined daughter would sing and clap along. While I still struggled internally with the fact that Sofie watched television before age two, I knew she watched far less than many other children. And I made sure to balance her screen time with plenty of unstructured play including reading, drawing, building, dancing and, like Dora, exploring the great outdoors. The fact that we usually watched and discussed the shows as a family makes a big difference from using television as babysitter or as constant background noise. Today, of course, there are tablets and phones to add to the “screen time” worries of parents. I applaud those parents who do follow the AAP guidelines, as they are made of stronger stuff than I. I am glad we only had the TV to contend with when my daughter was young. Now that she is seven, I can see that some early exposure did not harm her development. Sofie was speaking in full sentences before she could walk and now devours chapter books in one sitting. TV and videos are still a part of our family life, but not a big part. I guess we approach this “mental junk food” the way we approach edible junk food—everything in moderation. You can download this “Green Time vs. Screen Time” tool from Nature Play to see how your child’s screen time compares to outdoor activities. What are your thoughts? How do you handle TV and young children? Vancouver’s Winter Solstice Lantern Festival. Photo: Flickr/ItzaFineDay. The days are getting longer. Really. Although it may not seem like it on this longest night of the year, when, in Rhode Island, the sun sets at 4:15 p.m. and doesn’t rise until after 7:00, daylight incrementally increases after the Winter Solstice. 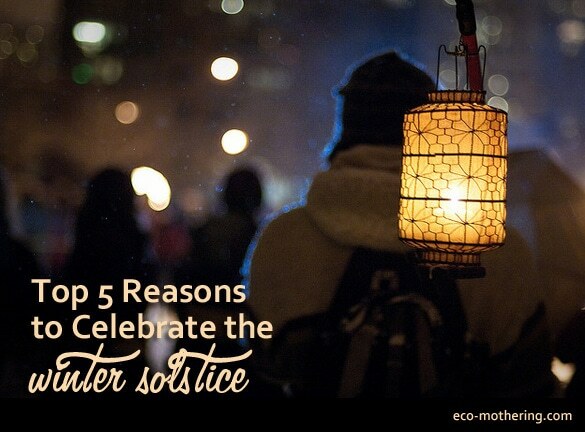 Midwinter festivals are meant to celebrate the return of the sun. So sleep well tonight and enjoy that extra few minutes of sunshine tomorrow. A chance to reconnect with nature. Winter Solstice celebrates the seasons and the return of the sun. It is the perfect time to enjoy a family hike in the woods or a visit to your local zoo or wildlife reserve. Alternatively, you could create a bird feeder with the kids to welcome furry creatures in your backyard. Eating, drinking and role reversals. At least that was the rampant kind of fun ancient Romans had when celebrating the Winter Solstice with a festival known as Saturnalia. The weeklong hoopla involved feasting, gambling and the aforementioned role reversals, which meant that masters waited on slaves, children directed parents and employees ruled over bosses. Sounds like a good theme for a party, eh? Time to plug out and power down. Christmas is such a time of gaiety and merriment, noise and busy-ness. The Winter Solstice is a welcome change from all of that. Take a break from being plugged in. My family has enjoyed many a Solstice by powering down—turning off all electronics and lights, moving with the rhythms of nature. The experience has always been a rejuvenating one. It feels good to spend a day without electronic distraction and be reminded of what stillness feels like. Take the focus off gifts. Sometimes you just get tired of all the Santa Claus wish lists, the unsolicited toy catalogs in the mail and the non-stop television advertising. With that kind of bombardment, of course kids think Christmas is all about the presents. Celebrating the Solstice in addition to Christmas can be a way to add another layer to the season, whether you choose to focus on community festivals, giving to others or just hanging out in nature. To Barbie or Not to Barbie? I have a confession. Yesterday, I bought my daughter a Barbie. Once upon a time, I swore there’d be no Barbies in our house so that Sofie would be free from cultural feminine stereotypes and negative messages about her body. But lately, with Barbie Fever running rampant through her peers, I’ve been rethinking my position. Perhaps I’m melting under pressure of her soulful, pleading face as she suggests to me that maybe one day, when she’s big enough, she can have her own Barbie. Or perhaps it’s due to a vision of my anorexic, fake-blond adult daughter one day informing her therapist that all her body image issues stem from having never been allowed to own the coveted doll. There is some truth to that. I know that the forbidden object only increases in its desirability and, therefore, its effect. And similar to the toy gun issue … even if you ban them from your house, your kids will turn something else into a pretend gun. My sisters and I played with Barbies. There was no stigma then. She was just another doll everyone had. I chopped her hair, sent her on dates with Ken and eventually abandoned her in a toy bin along with a bunch of other less sinister dolls. Avoiding Barbie will not avoid negative messages. Sofie will be bombarded with them all her life. My job is simply to equip her with the self-esteem and inner strength to withstand the onslaught. I can’t bury my head in the sand about it. Better to face the enemy head on. Give her the Barbie to play with. And keep giving her positive messages about her body. Ballerina Barbie is the one Sofie really wants. I bought it at Walmart, which feels like it only compounds the sin. I did at least avoid the blond, pink-attired cliché, and chose the more sensible brunette wearing purple. (As a side note: the ballerina doll has flexible feet that stand flat!) I draw the line at Barbie’s numerous plastic accessories and acquisitions. She can live in the wooden dollhouse Sofie already has. What they really need is an Eco Barbie (made from all recyclable materials). She’d be wearing second-hand clothes (a “Respect Your Mother” T-shirt), no makeup and jewelry made from salvaged metals. 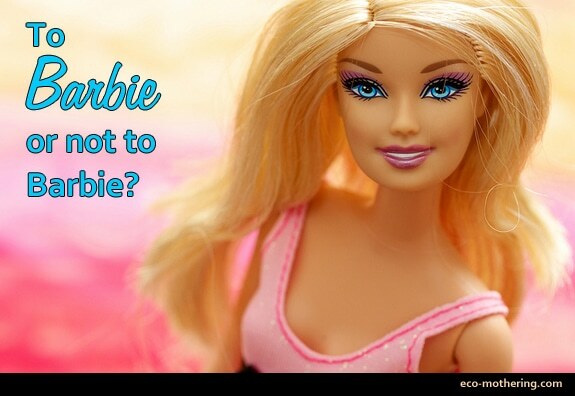 Eco Barbie would come complete with her own recycling accessories, a hybrid car and an organic canvas Dream Yurt. ​This whole Barbie issue reminds me how uncertain parenting is. So many things I was once adamant about can simply slip away into indifference, while issues I never expected can blindside me. Accepting that I can change my mind mid-game continues to be a refreshing revelation.